The bishop presents the painters with some extraordinary scrolls. With the help of these chronicles of the elder masters, the players now can restore the fresco according to his fancies and earn extra victory points. 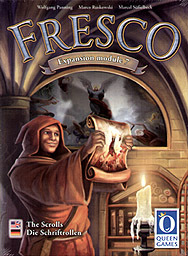 Playable only with the basic Fresco game.